I've actually mapped this out for the PT. 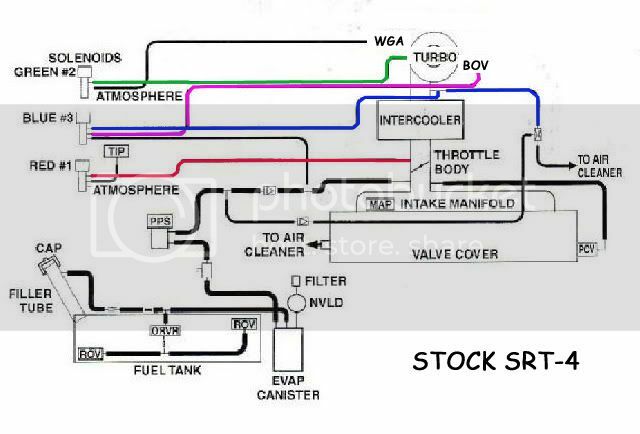 The green line (srt) is the cream colored line (PT) that goes to the back of the turbo (line right behind the air intake pipe) Blue line (SRT) is the gray vac line (PT) that tee's into the hose coming out the front of the turbo. Black line (SRT) is the dark brown line (PT) that plugs into the wastegate. Pink line (SRT) is the off white (bone colored) line (PT) to the surge valve. They say the green line (cream) produced more TQ less HP and the BLue line more HP less TQ. 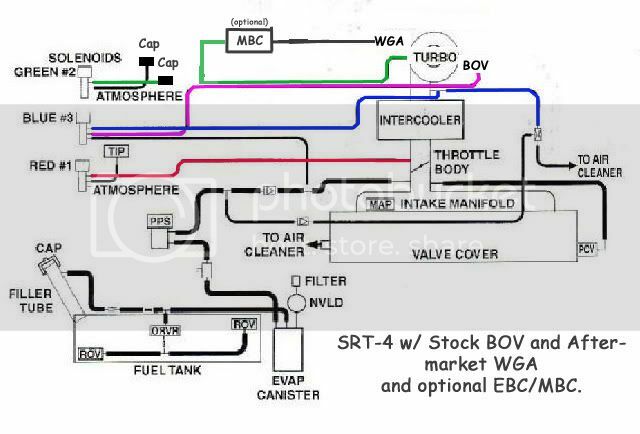 They suggest having an aftermarket BOV to run off blue line or BOV (if you have the Mopar one, would go off constantly) So I ran my WG and BC off the Throtle body which was suggested if you don't have an aftermarket BOV. I got really bad compressor surge so I disconnected it and just ran i this way. Capeed green (cream) and black (dk brown) line ran line from back of turbo to BC then from BC to WG. All other lines left stock. I still get minimal compressor surge but not as bad a running off the TB. Still looking for other ways to do it, might try the other lines when I have the time. Hope this helps you. Thanks for the info Bro. I'm going to run a boost controller in a bit. But I'm going to use it with the stock WGate actuator to see what type of benefits that it will provide. Are there any downsides that you've noticed, in running the MBC? Hopefully we can get together either late July or August at the Cali speedway. Thanks a lot! Been meaning to do this but never got the chance. My DSBC is run from the throttle body and goes to the WGA. Waiting on Stage 1 (this week) before I run the DSBC directly off the turbo (green line). as they say the Blue (gray) line is detrimental in the long term. The next step would be an adjustable WGA. Is there a benefit from running an aftermarket BOV off the blue line instead of the TB? Currently mine is run off the TB. I would run your aftermarket BOV just the way you have it. Thanks for the info, as you know I have been pleading for SOLID info from GT people. Have the Greddy coming and want to have a place to start. My head hurts from the SRT people's color scheme. I have the Mopar BOV so your info is good on this. I did not see are you StageI? One more question, do you get full boost at partial throttle on either setting? I don't get full boost at part throttle on the low setting, at 3000 rpm I get about 7psi. I hardly ever drive with the high switch on, the few times I did have the switch on I never went above 3,000 rpms. It was either WOT or just cruising. Thank you sir. Then I'm taking that it's just like normal.